This year, I’ve decided to add in one non-fiction (self-help or how to) review a month. With celebrating the Self-Rescuing Princess type, I decided this year to read at least one non-fiction book a month so I can either improve my skills in an area or learn a new one. For March, I decided to tackle organizing. 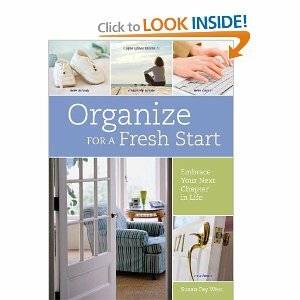 I really enjoyed Organize for A Fresh Start: Embrace Your Next Chapter in Life and how it focuses on organizing … from belongings, to finances, to time … after a person enters a new stage of life. It addresses how once a new stage of life is entered (marriage, divorce, children, grandchildren), the way we’ve done things in the past might no longer work. There are lists at the back of the book to help with decluttering projects. I really liked how the book separates dealing with inherited items and those belongings of a deceased loved one, from regular accumulated stuff. The author acknowledges that it will be harder to make decisions on possessions passed down and those that had belonged to a loved one who has passed away. She is respectful about the feelings and memories associated with these special type of belongings and encourages people to take their time, even if it means a few years. I found the book to be written in a very practical and encouraging style. As I was reading, I kept nodding and started to understand why some of my organizing systems no longer worked. I have added more obligations and projects to my life over the last two years, and never took a look to make sure the old set-up for my office still worked for me now. Also, now that my children are teenagers, we need a new system in place with them to keep track of sports, work, and social schedules. Sometimes I walk away from books like this feeling discouraged and guilty for not having been able to keep everything maintained. This time I could see why our system doesn’t work and have some plans on what could work. No guilt, just helpful ideas.